Fickle Feline: Giving Thanks: My Friend Jennifer. When I was looking for a picture of Jennifer for this post, I wasn’t sure which one to go with. I stole this off her flickr account because our friendship has always involved food, one way or another. 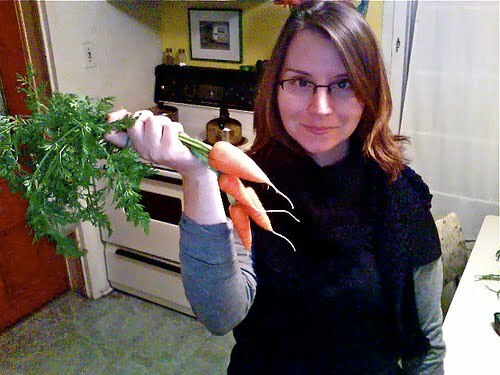 Jennifer has a fantastic site about Vegan cooking called It Ain’t Meat Babe. She inspires me to eat local, try new things in the kitchen, and garden. When she visits us she cooks up a storm, plays with my kids, and doesn’t mind when I take an afternoon nap. We have known each other for over 25 years (so long that she never needs the background on a story because she lived through it with me). Jennifer was my maid of honour, was there for Max’s birth, and is Cameron’s favourite Aunt. I worry sometimes that I am a bit of a bore to her (she has a pretty fun life and a lot of super interesting friends), but she sticks with me through the day-to-day, mundane conversations about living in the suburbs and poopy diapers. She is also a great person to shop with and when I’m out with her I always end up buying a foxy dress (or two). We sure are different, but it has never kept us from being great friends. I used to sign off my letters to her with "I'm your trailer park and you're my hurricane". That's true to this day (though I'm the one they named a hurricane after!). Looks to me like you hang out with a pretty classy bunch. Nana, your mom, Cameron, Max, Scott, Jesse and Jennifer. And I bet you aren't done yet. I am certainly not done yet. "I'm your trailer park and you're my hurricane". Jennifer (It Ain't Meat, Babe) 5:16 p.m.